Can one person change the life of an entire island? Definitely yes. For the art-revolution Lithuanian artist Ernest Zacharevic needed 6 city walls, 3 months of work and 1 festival thousand miles away from his European world. If art can change the space and the way of people thinking? See the proof of Penang Island. What does we know about Malaysia? Tropical beaches, Kuala Lumpur, Petronas skyscrapers and an unusual taste of a cultural cocktail, consisting of the Malay, European, Indian and Chinese traditions. The most possible, that’s all. Meanwhile, the greatest impressions of the country are in 350 km away from Kuala Lumpur, in Georgetown, the capital of the state of Penang. The city was founded in the XVIII century and by the beginning of the XXI century its historical center was named as a UNESCO World Heritage Site. The state authorities decided to celebrate this significant event in a rather non-trivial way. Instead of “preserving” the space, they decided to refresh the city. Since 2010, Georgetown hosts the George Town Festival. The International New York Times is sure about it: “George Town Festival is growing into a major Asian arts event”. 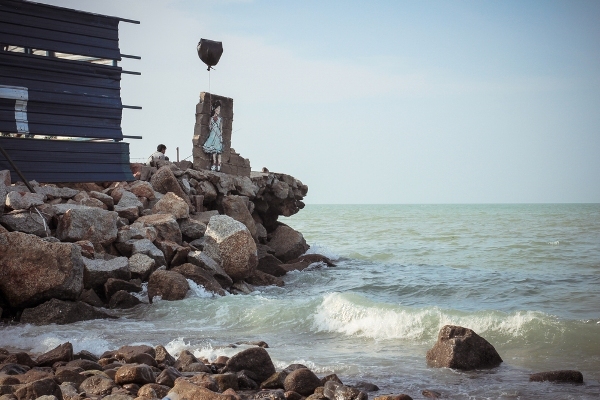 One of the residents of this project was a young Lithuanian artist Ernest Zacharevic, who changed the image of Penang both in the world and in the state itself, turning it into a mecca of street art in Southeast Asia. The Lithuanian artist, who “blew up” social networks with his vision of street art, is usually called the Asian Banksy due to the influence he made on the development of art in the Southeast Asian region. His first graffiti Ernest ZACH Zacharevic drew in his hometown in Lithuania, in one of the criminal areas. The plot of the work reflected the crime situation of the place, which did not please the authorities. A few days later the graffiti was painted over. 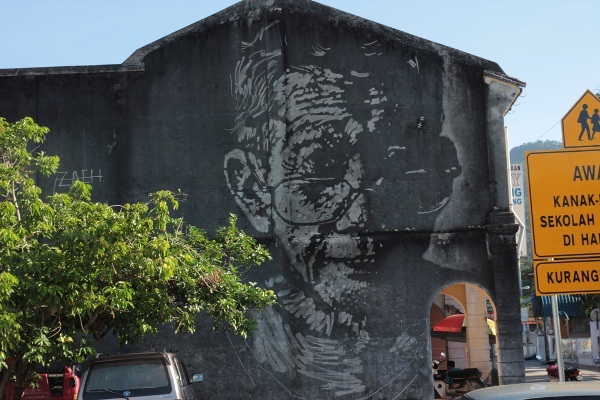 World fame Ernest Zacharevic won as a “chronicler” of the island of Penang. Today his works can be found in the USA, Iceland, the United Arab Emirates, Switzerland, but it was Malaysia who became his muse. In here the artist returned several times, after participating in the festival. He painted new works and restored the already created ones, because they are not protected by climate control systems or stored in the calmness of art-galleries. But thanks to it, Penang is usually called an open-air museum. Experimentation lies at the heart of Ernest’s style, with the only constant being the dedication to his ever-changing concepts. ZACH’s primary interest is in the relationship between art and the urban landscape, with concepts often evolving as part of a spontaneous response to the immediate environment, the community and culture. It’s easy to see how his art-works fit the place and become the part of the urban narrative. 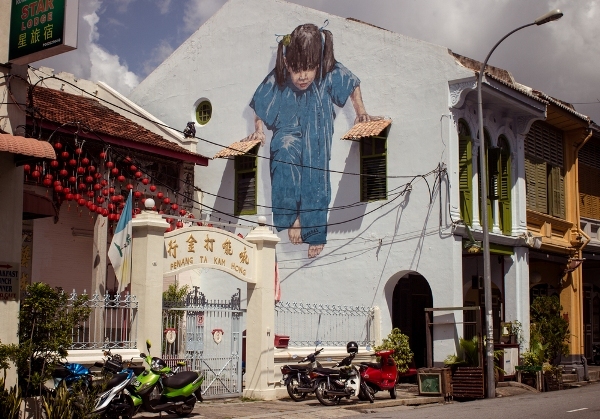 It took the artist 3 months to prepare for the George Town Festival and to make 6 full-fledged “canvases”, the heroes of which were ordinary inhabitants of Penang. He painted children riding a bicycle, rickshaw drivers waiting for fares, girls looking wistfully out to sea and others. 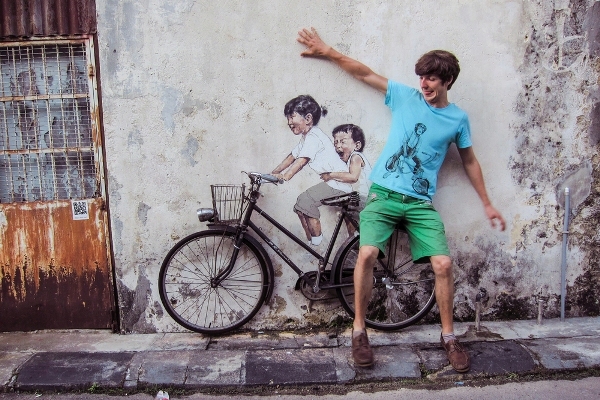 The public resonance caused by Zacharevic ‘s works can be called phenomenal. In addition to locals, who totally accepted the art of graffiti on the walls of their houses, the city space of Georgetown became a subject of interest of the world community of professionals of street art. Inspired by the image of the urban environment created by Zacharevic, world-known guru of graffiti came to Georgetown to bring here their works, local artists also became more active. The works of Asian Banksy are the “city brand” nowadays. They can be seen on postcards, magnets, T-shirts and other souvenirs. Today Georgetown is an open-air museum, a popular tourist center, the city of art and other Penang towns also want to be in focus of the street art artists. 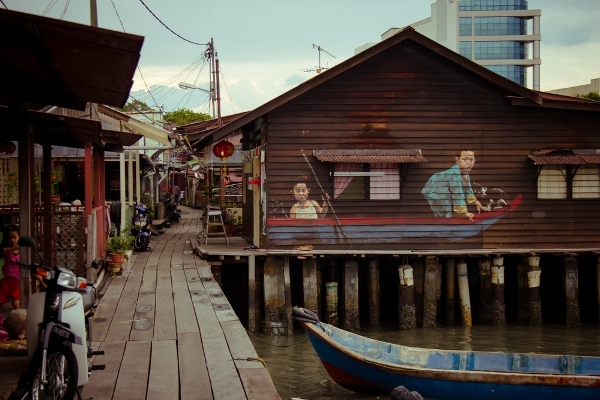 An example for colleagues again showed Zacharevic, who make graffiti in the town of Balik Pulau, located in the other part of the Penang Island. Posted in Art, Design and tagged art, Asia, graffiti. Bookmark the permalink.